For us Oregonians, this is day two of sunshine!!! Those of you who live in the warm sunny climates have no idea how happy we get to have consecutive days without the gray skies! I was going to go to yoga this morning, but opted instead to take a walk with Miss Bella and enjoy the chirping birds and sun on my face. I have been meaning to get out our Easter decor for the last three weeks, but there have been other projects going on so I'm just now getting around to it. Over the weekend, the lady who had the space next to me at the faire had a papier mache lamb. I added the cross into the vignette- it was also a Christmas decoration that I purchased from Target a few years ago. I layered some vintage books from Jon's grandpa who was a minister, under it. 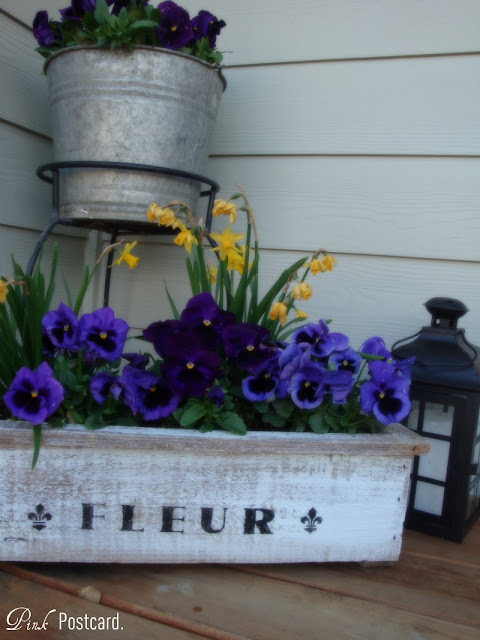 The daffodils are from the farm I wrote about here. A spring time ribbon with fun, childlike words are tied around the lamb's neck. The eggs are real- I blew out the yolks and then dyed them so I would have them to save for future Easter decor. Have you ever tried that? 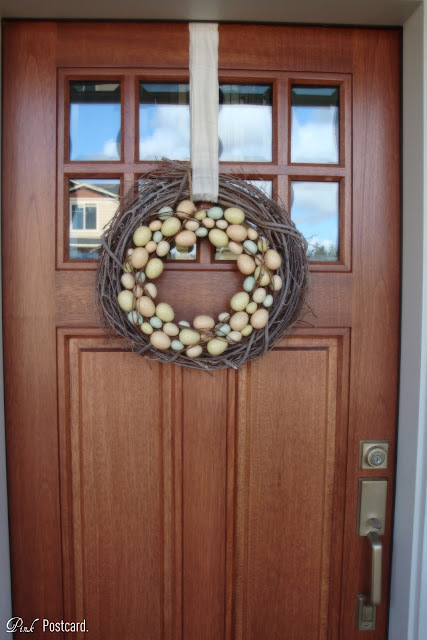 For our front door, I have an egg wreath that I purchased when Mervyn's was still around. Post Easter, I got it for $1.99. My intention was just to take down our everyday twig wreath and put up the new one, but I decided to layer it and like it so much more! 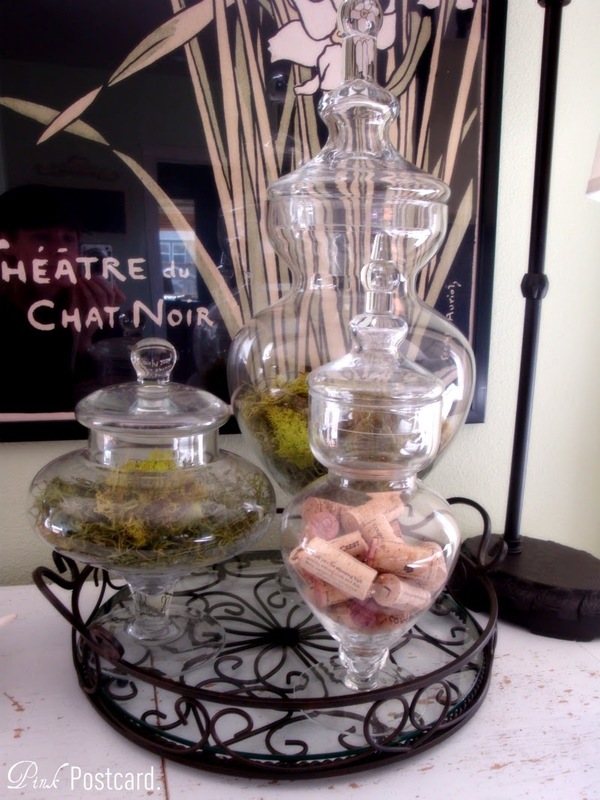 In rearranging our dining room centerpiece, I had to move my glass jars, so I tried them over on our buffet in our great room. 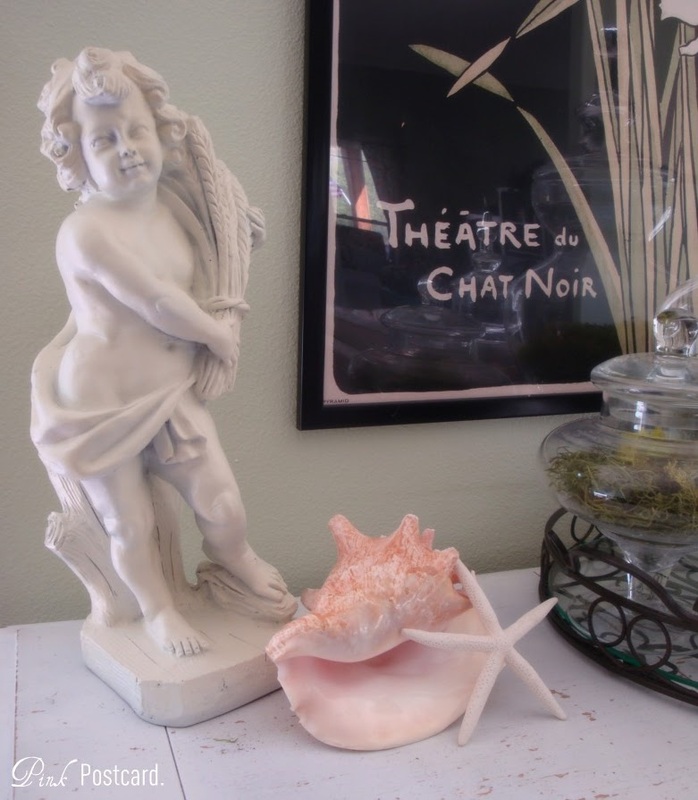 The statue has been here for a little while- purchased from TJ Maxx and spray painted white. 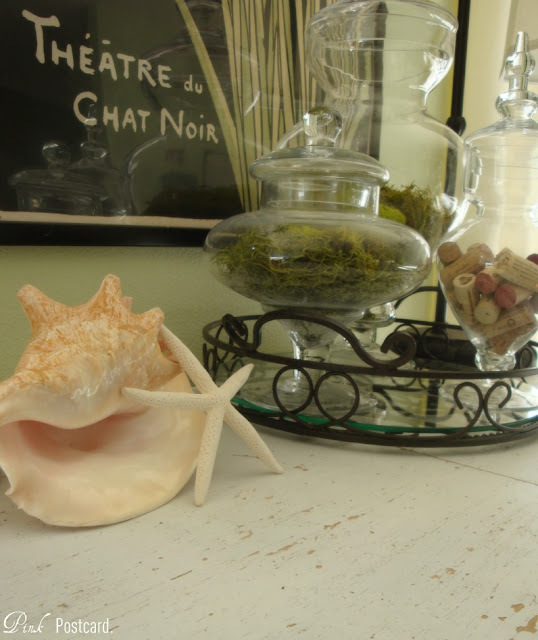 I just love seashells- it doesn't matter what time of year! I corralled all of the jars with a tray. The moss is staying in them because it works with the green in the print and looks springy! We collect wine corks from all of our get togethers and special events here. I have another larger one in the dining room. To me, it's a keepsake of good memories. I just love the chippy paint! Do you decorate a lot or a little for Easter? Enjoy your Tuesday~ I hope sunshine is finding you! Love your lamb, such a sweet centerpiece! 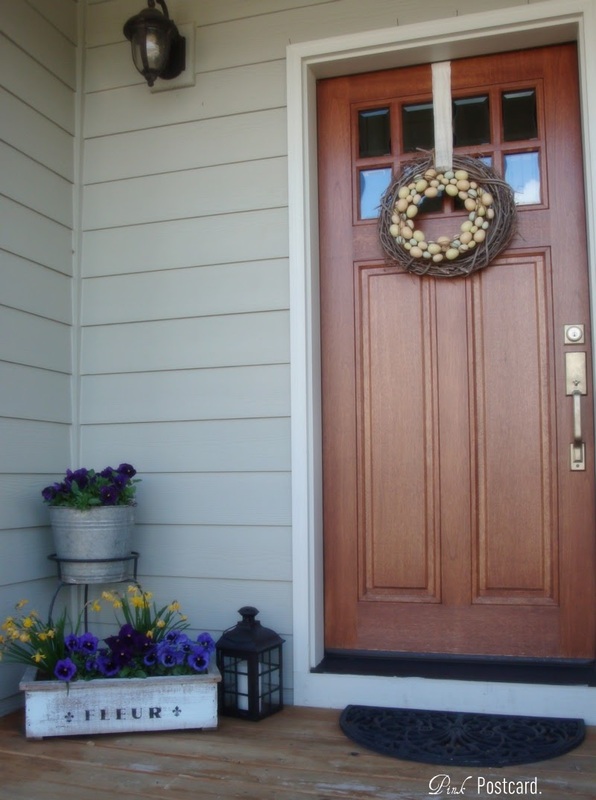 What a pretty front door, love the wreath and flowers...such a welcoming space! It all looks so pretty and the lamb is precious. Your hutch is stunning and I love this vignette! I love apothecary jars but run out of ideas on what to fill them with, I love the moss! Lovely photos. I'm going to use your idea for the wine corks. Now I'm your newest follower. I love the fleurs box on the front porch, so cute! And that chippy buffet, adorable! I haven't brought out the easter stuff this year..I can't believe it's almost here! 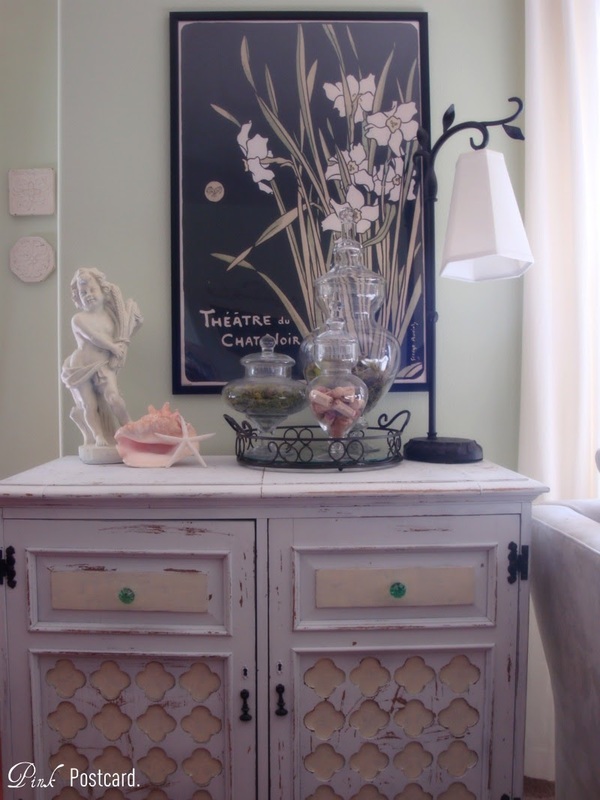 Liked all your pretty vignettes. 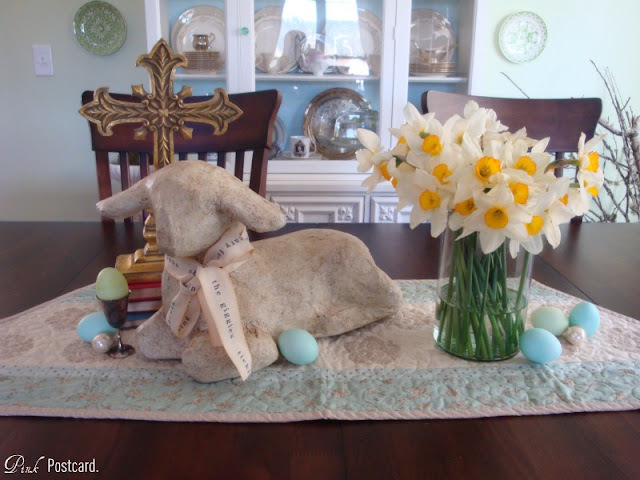 The one on your dining table is really neat with the lamb and the cross. Your daffodils are so very pretty too. I don't do much other than some fresh flowers and some pussywillows but you've certainly inspired me to do more! Denise, the lamb is so awesome! I never thought about using Christmas decorations for Easter decor. Fantastic idea! 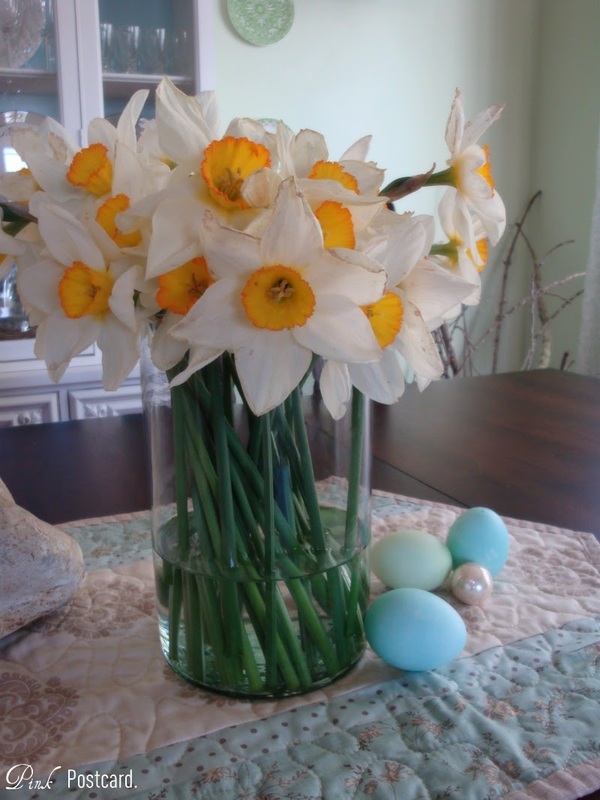 I've never really ever decorated for Easter - just try to set a pretty table for dinner. You have inspired me! That lamb is fabulous! So cute. Everything is fab!